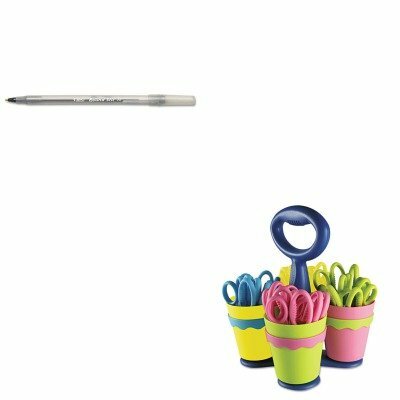 KITACM14755BICGSM11BK - Value Kit - Westcott School Scissor Caddy and 24 Kids Scissors With Microban (ACM14755) and BIC Round Stic Ballpoint Stick Pen (BICGSM11BK) by Westcott at KBFS. MPN: ACM14755BICGSM11BK. Hurry! Limited time offer. Offer valid only while supplies last. lt;stronggt;ACM14755lt;/stronggt;lt;BR/gt;Westcott School Scissor Caddy and 24 Kids Scissors With Microbanlt;BR/gt;Convenient classroom-size caddy. lt;stronggt;ACM14755lt;/stronggt;lt;BR/gt;Westcott School Scissor Caddy and 24 Kids Scissors With Microbanlt;BR/gt;Convenient classroom-size caddy. Scissors have plastic handles and safety blades. Scissor handles and caddy are infused with Microban antimicrobial product protection to inhibit the growth of bacterial odor. For left or right hand use. Cut Length: 2amp;quot; Scissor Length: 5amp;quot; Tip Type: Pointed.lt;BR/gt;lt;BR/gt;lt;stronggt;BICGSM11BKlt;/stronggt;lt;BR/gt;Westcott School Scissor Caddy and 24 Kids Scissors With Microbanlt;BR/gt;The economical choice for performance and reliability. Colorful frosted cap and translucent barrel for visible ink supply. Flexible round barrel for writing comfort. Long-lasting: more than 7,200 feet of writing in each pen. Pen Style: Stick Ink Colors: Black.